Nothing can match the sense of happiness that a Mommy feels while cradling the Little One for the first time. Of course, each Daddy and Mommy hope their Little One can grow and develop healthy and smart. To ensure optimal growth and development process, Mommy must provide nutrition and stimulation according to the needs of the Little One. In addition to these two important factors, Mommy must also pay attention to whether the growth is in accordance with her little one's age or not. In the first month, the Little One will be able to move his/her head to all sides. Your Little One can also hold Mommy's hand tightly. Not only that, your Little One is able to see around, but not with 100 percent focus. The next month, the Little One begins to play with his/her fingers and may have started to smile. The third month, ne begins to touch and catch objects. He/she will try to hold things with his/her hands. Not only that, the Little one also begins to make the sound of babbling. To stimulate hearing, Mommy can give your Little One toys with sounds. The fourth month, when the Little One is in prone position, he/she can push his/her arms. Invite the Little One to play and your Littke One will respond to Mommy with a loud laugh. The fifth month, the Litte One begins to explore his/her surroundings by rolling from one side to the other side. Your Little One has also started to recognize familiar faces, such as the face of her Daddy and Mommy. 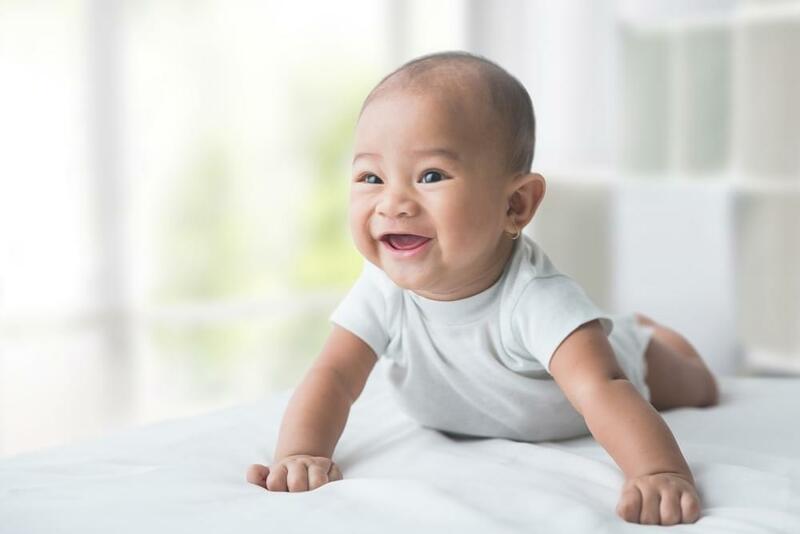 The sixth month, your Little One’s chatter begins to become more frequently heard and his/her hands are increasingly adept at grasping objects around him/her. The seventh month, the Little One begins to crawl. It also begins to respond to the expressions and emotions of others. The eighth month, the Little One begins to sit without help, clap hands, and interact further with others. The ninth month, do not be surprised if the Little One is more adept at crawling and start feeling anxious in the middle of strangers. Mommy can teach her Little One to say an easy word like "mommy" or "daddy". This will stimulate your Little One’s ability to talk. The tenth month, the Little One begins to stand on its own, to stack and arrange its toys. Your Little One also can wave his/her hands. Not only that, the Little One begins to understand the cause and effect relationship, for example Mommy will come if he/she cries. The eleventh month, the Little One begins to step its foot to walk, but still with the help of surrounding objects. He/she also can say a simple word and understand the meaning. The twelfth month. The Little One can stand without holding, and can say two or three words. Do not be surprised, your Little One is transformed into a master imitator by mimicking the movements that Mommy often does. Well, with the above guides, Mommy need not to be confused again with the benchmarks of the Little One's growth and development. Now, the task of Mommy is to provide balanced nutrition and stimulation according to his/her age, so that Little One's growth and development can be in accordance with the reference. As parents, you undoubtedly want the best for your children. Nevertheless, your children often do a lot of things that cause detrimental effect for their health, like sucking their fingers, biting their lip and pushing their lip away.